As I was around Publika and Solaris Dutamas area recently, I decided to have my Iftar at PickNik. They have two options: Juadah Opah and Juadah Bonda. It's basically kampung food... in a chic shopping area! 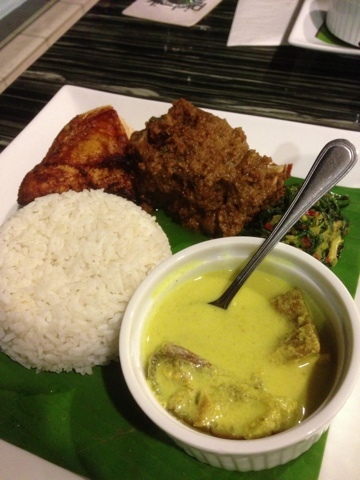 The above pic, it's Juada Opah, which is the beef/chicken set. The latter is the fish set. For RM33++, I believe it was worth every penny. Apart from the chicken, beef and kuah lemak ikan mason that you can see in the pic, there's also beef soup as starter, ulam-ulam and pelat pisang for dessert. During this Ramadan period, many establishments may have their own Ramadan set. Some might be overpriced but PickNik's Ramadan set is worth a try!